Carlsbad Unified School District will host two Facilities Master Plan Information/Feedback Sessions for community stakeholders (including parents, residents, and staff members) in January. The focus of the sessions will be on District Wide Phase 1 Projects. 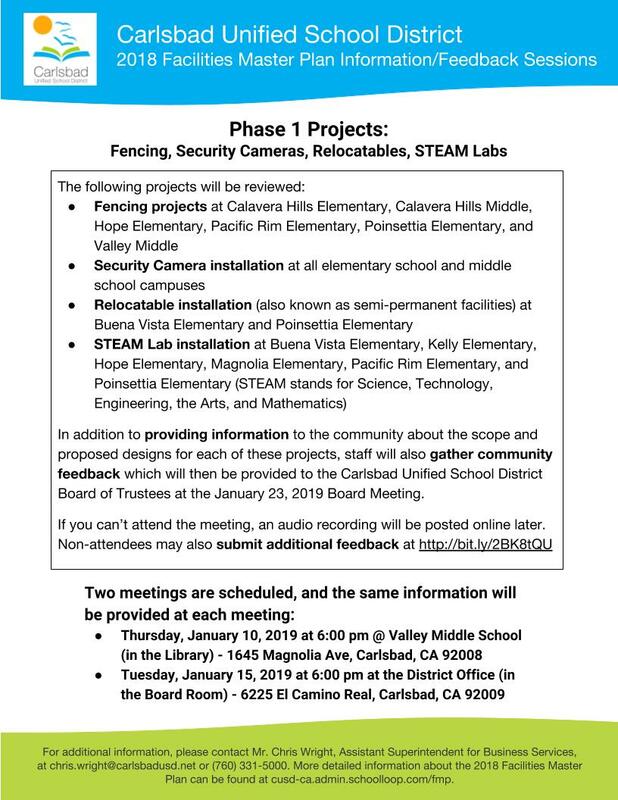 In addition to providing information to the community about the scope and proposed designs for each of these projects, staff will also gather community feedback which will then be provided to the Carlsbad Unified School District Board of Trustees at the January 23, 2019 Board Meeting. If you can’t attend the meeting, an audio recording will be posted online following the meeting and will be accessible via the District website at http://cusd-ca.admin.schoolloop.com/fmp. Non-attendees may also submit additional feedback at http://bit.ly/2BK8tQU. A schedule for future Community Information and Feedback Sessions will be released in January. Additional dates will be scheduled in February and March to focus on District Wide solar installation, the renovation of Kelly Elementary, Hope Elementary, and Magnolia Elementary schools, and the renovation of the Carlsbad High School science building and chiller plant. at chris.wright@carlsbadusd.net or (760) 331-5000. More detailed information about the 2018 Facilities Master Plan can be found at http://cusd-ca.admin.schoolloop.com/fmp.